Windows Live Essentials 2011 is a collection of freeware programs from Microsoft. The WLE 2011 package includes Windows Live Writer 2011, Windows Messenger 2011, Windows Mail, Windows photo gallery, Windows Movie Maker 2011 and a few other useful applications. Currently there is no option to download these applications separately. Microsoft provides an online web installer for Windows Live Essentials 2011 at the official web page that you need to connect the internet and download the full setup. If you have more than one PC or laptop it’s better to download the standalone Windows Live Essentials 2011 installer to save bandwidth and time. Windows Live Movie Maker 2011: With Movie Maker in Windows Live Essentials 2011, you can create movies from your photos, video collections and customize it with sounds, and effects and transitions. Windows Movie maker lets you import photos and video files from an external storage device or from you hard disk and edit them in a wizard driven process. You can split or join videos, edit or and sounds and animation using the tools provided. The created movie files can be uploaded Windows Live SkyDrive and share it with Facebook, Messenger or YouTube friends. Windows Messenger 2011: Windows Live Essential 2011 offline installer includes the latest Windows Live Messenger with social network integration. The new Messenger has a redesigned interface which includes MSN services and social sections in one single window. In Windows Live social, you can add Facebook, Flickr, MySpace, LinkedIn, WordPress, Digg, Blogger and several other services and get live update from friends and read the feed of their activities. Windows Live Messenger 2011 lets you chat with Yahoo Messenger, Facebook friends and make HD video calls with contacts. There is an MSN tab where you can read news and weather updates from Microsoft MSN web portal. Windows Live Writer 2011: The Windows Live Writer is one of the best features of the Windows Live Essentials 2011 pack. It’s a desktop blogging software that supports WordPress, Blogger, Typepad, and other blogging platforms. With Windows Live Writer, you can create, draft and publish blog posts without opening the web interface. The Word like ribbon interface in Windows Live Writer is pretty familiar and easy to use. Apart from this, Microsoft has a web library, where we can find several plugins that will improve the functionality and features of the Live Writer. Windows Live Photo Gallery 2011: Photo gallery as the name indicates is a photo management application includes in Windows Live Essentials 2011. You can import your photos from a digital camera or any external store device, organize and edit them with effects and corrections. There is also an option to publish selected photos directly to social networking websites. Windows Mail 2011: The new version of the WLE helps users to manage their multiple mail accounts from the desktop using Windows Mail. The Facebook and Live integration in Windows Mail will load contact email IDs directly from online profile of friends. Windows Live Mail also has Calendar, Feed and Newsgroup management tools. Update: Download Windows Live Essentials 2012 standalone installer here (direct link). 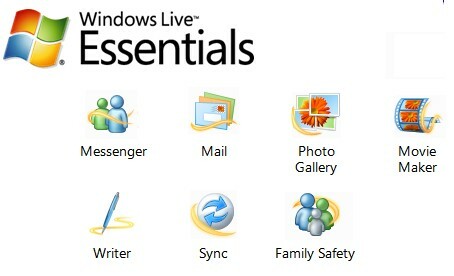 Other important software tools in WLE package are Windows Live Family Safety 2011 (Parental Controls), Windows Live Mesh (Free backup and sync), and Microsoft Sliverlight (Flash alternative). Thanks heaps for this link. what is be the one package for instalation? WLM 2011….problems with newsgroups, won’t display header contents..
1.- To make a webcam session you have to make a videoconference, not like 2009 to older versions, that if you want ONLY a webcam session, then u get that…and if you want a videoconference, then u go to it. 2.- Isn’t compatible with the new version of msn plus!. 3.- Doesn’t allow you to use only the name, u also has to provide your last name. Right now I found a patch to avoid the update…those that agree with me…then use ResHack to avoid the update. Thank you for the suite. Thank you about MS.Live Essential 2011.
it’s terrible if download from Ms.